When I learned that Cloud Strife, the main protagonist of Final Fantasy VII, would be joining Super Smash Bros. as a DLC fighter, I didn’t even think twice. The character is, in my eyes at least, an icon of video game history. He is after all, a big part of the game that made RPGs mainstream. And the irony of Nintendo putting the protagonist of the first core Final Fantasy title to be released on a nin-Nintendo console in their renowned fighting game franchise was enough to justify the $5.99/$6.99 price. But not everyone shares the same opinion, so I’d like to look at the entire Cloud Strife DLC package to objectively assess if it really is worth purchasing. Note that the DLC can be purchased for either the 3DS or the Wii U or both. When I mention pricing, the first rate is for a single version only (either 3DS or Wii U) while the second rate is a bundle for both versions. So what does the DLC package have? Of course, what people are really paying for is the Cloud Strife fighter and the Midgar stage, so let’s discuss these first. I’m not a professional Super Smash Bros. player so I can only talk about what Cloud brings to the table for a casual fan. Using Cloud feels a little bit like using Shulk; he’s a swordfighter whose attacks have good reach thanks to the huge Buster sword. What really stands out though, especially in the eyes of casual fans, is Cloud’s special moves which are based on his Limit Breaks in Final Fantasy VII. To be honest, if we look past the nostalgia factor of seeing his old Limit Breaks, I’d say Cloud’s special moves are pretty basic. His up special is the Climhazzard, an upward sword slash that an be followed up by a downward slash. His side special is the Cross Slash which is a multi-hit flurry of slashes. His neutral special is the Blade Beam, which is a long range wave attack that opponents can’t crouch under. What sets Cloud apart from the rest of the Super Smash Bros. roster is his Limit Break mechanic. Similar to Little Mac’s KO meter, Cloud has a Limit Break meter that fills up as he takes damage. Unlike Little Mac, Cloud has the Limit Charge move as his down special which also fills up this Limit Break meter. Once this meter is completely filled up, Cloud can perform a stronger version of any of his special moves. Doing so completely drains the Limit Break meter, so anyone using Cloud will have to charge that Limit Break meter up frequently to gain access to the stronger special moves. Filling up the Limit Break meter also turns Cloud’s down special into the Finishing Touch move, which does very little damage but has high launching power. I’ve successfully KOed opponents at 75% damage with this move and have won matches that I should have lost. This is a little similar to Little Mac’s KO Punch but without the time pressure – unlike Little Mac’s KO Meter, Cloud’s Limit Break meter doesn’t go away over time. Cloud’s standard moveset made it easy to use him in the game, and I’m actually able to beat Level 9 AI opponents with Cloud consistently despite having him for only two weeks. Cloud is a pretty good Smash Bros. fighter, but the real highlight of this DLC package in my opinion is the Midgar stage. I’m not really going to go into detail about how the stage looks and instead focus on it’s structure and gameplay mechanics. 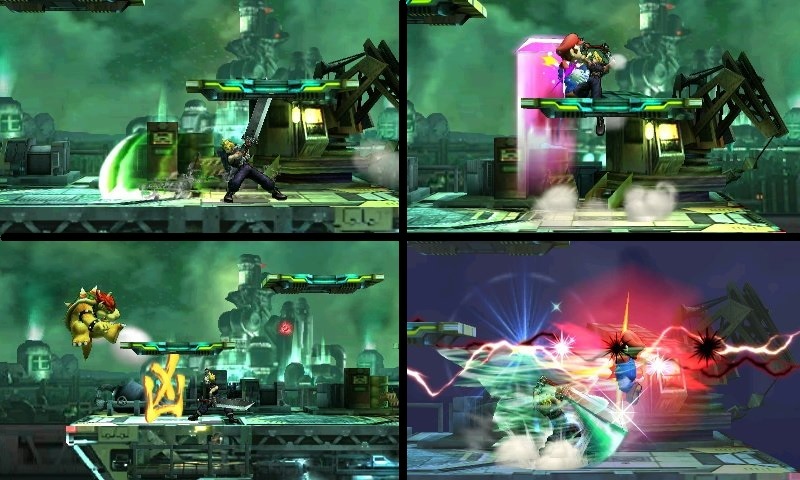 The Standard form of the Midgar stage (Wii U version). At first glance, the standard version of Midgar looks very similar to the Battlefield stage, with three small platforms in triangular formation above a bigger main platform. The Midgar stage has a special gameplay mechanic that references a popular Final Fantasy VII mechanic – Materia, or specifically Summon Materia. During battle, a Summon Materia can appear at random places. If a fighter touches the Materia, one of five of Final Fantasy’s espers (that’s what they’re called in Final Fantasy VI) appears and does their signature attack. These signature attacks involve splitting the stage in half (Odin), rearranging the smaller platforms and electrifying them (Ramuh), blasting the stage with fire (Ifrit) or a massive pillar of energy (Bahamut ZERO), or trigger a massive flood that can sweep players off the stage. The summons and their attacks are what I love the most about the Midgar stage. All of them are visually impressive and give the player who summoned the esper a slight advantage but not as intrusive as the Flying Men in the Magicant stage or the Yellow Devil in the Wily Castle stage. When summoned, Odin splits the stage in half, which stays split for a short period of time. I really think that Cloud and the Midgar stage is already worth the $5.99/$6.99 cost of the DLC, so I’d like to think of these as bonuses that come with the package: the two Cloud virtual trophies that you can unlock which has no use whatsoever, and two Final Fantasy battle themes. Super Smash Bros. already has a solid selection of video game music from various Nintendo franchises and these FF themes are certainly worthy additions. I own a 3DS and I use the game’s music player a lot, so I really appreciate having more classic video game tunes to listen to. 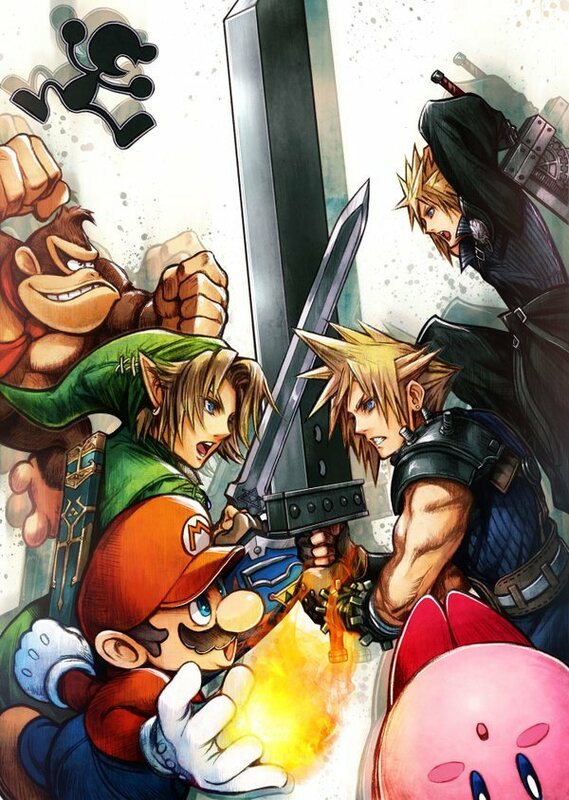 Official art depicting Cloud against Nintendo’s Super Smash Bros. fighters by Final Fantasy character designer Tetsuya Nomura. Now let’s dissect the DLC pricing a little more objectively by comparing the $5.99/$6.99 price of the Cloud DLC to the pricing of other Super Smash Bros. DLC. 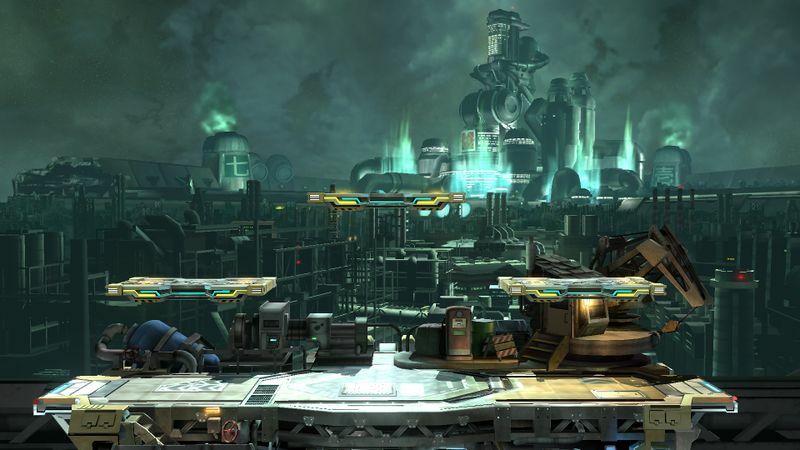 Completely new stages for Super Smash Bros. cost $2.49/$3.49, while DLC fighters cost $3.99/$4.99. If you bought one of the DLC fighters and a new stage, it would cost you a total of $6.48/$8.48. Technically, you’re getting a new fighter and a new stage for around $0.50/$1.50 less than if you bought them separately. With all that said, I highly recommend getting the Cloud DLC. Cloud is a good addition to Super Smash Bros. both because of how he plays and because of his name recognition (the Final Fantasy VII remake is just around the corner), while the excellent Midgar stage is a must have for fans of the game. If you enjoy Super Smash Bros., you should at least consider watching footage of Cloud and the Midgar stage to see how they work. Personally, I’m very happy with my purchase and I can’t wait for the remaining Smash Bros. DLC to be released. What do you think about the Cloud Super Smash Bros. DLC? Share your thoughts with us by leaving a comment or two below!